Welcome To Your Complete Guide To The Best Ferret Harness. We’ll Show You The Right Way To Walk Your Ferrety Friend! Mischievous, playful, and undeniably adorable, ferrets have been by our sides, working and playing, for nearly 2,500 years. Commonly misidentified as a rodent, the domestic ferret is actually part of the mustelidae family. This family includes weasels, minks, otters, martins, polecats, even badgers and wolverines! Intelligent and curious, ferrets have become increasingly popular exotic pets across the globe. 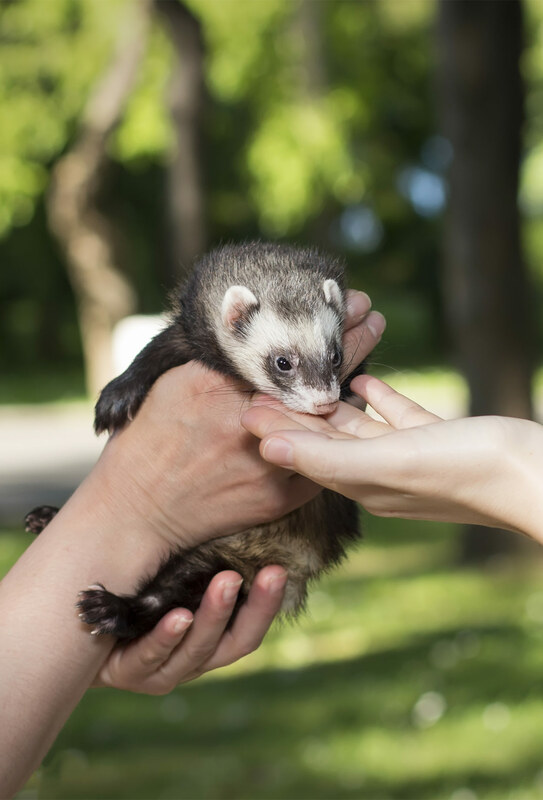 With more and more ferrets being kept as pets, ferret owners are joyously finding more and better options of specialized equipment to help them care for their furry darlings. Being incredibly high energy and playful, ferrets have a demanding need for intellectual stimulation and plenty of exercise. A fun way that this need can be met is by taking your pet ferret out and about for a walk, just like you would a dog! A lot of ferret parents find that their combination of smarts, personality, and curiosity make ferrets ideal candidates for leash and harness training. Can You Walk A Ferret? With patience, persistence, and the right equipment, most ferrets are able to learn how to walk on a leash with ease. Ferrets are energetic and curious, and will likely benefit from the exercise and fun they get from walking around with you. Plenty of ferret owners aren’t keen to take their ferret outside. The risk of fleas, ticks, animal attack, injury, and other diseases is higher in the U.S. than other places, but don’t worry. Leash and harness training can be very beneficial even if your ferret is an indoors only pet. If you need to travel with your ferret, or enjoy taking them to visit friends, being properly leash trained is a serious bonus to keeping your ferret safe. Why Use A Ferret Harness? A harness is an absolutely essential piece of equipment when it comes to safely leash training and walking ferrets. In the wild, a ferret’s narrow, tube-shaped body makes them ideal hunters of rats, rabbits, and other below-ground dwelling prey. Ferrets can negotiate narrow and tightly constricted spaces with agility and ease. This slippery nature remains a feature of our modern ferret friends. While this makes them mischievous and fun, it also means they are master escape artists. Putting a leash directly onto a collar of a ferret is both dangerous and ineffective. A ferret can easily be strangled or choked by pulling against a collar. They also tend to be very efficient at slipping out of collars entirely! Simply put, the safest and most effective way to leash train a ferret is with a quality body harness. How a harness is placed on your ferret will be different depending on what style of harness you choose to use. Follow the instructions that come with any individual harness. Don’t hesitate to reach out to your veterinarian if you have any concerns about the safety of a harness. Being slippery little escape artists, you will need to take the time to make sure a harness fits your ferret correctly before taking them outside. There is a balance between tight enough the ferret can not slip out of it, but not so tight a ferret is unable to walk or move comfortably. Give your ferret time to become used to a new harness. Introduce the harness early to get your pet comfortable with it as quickly as possible. Let your ferret romp and play indoors so you have plenty of time to make appropriate adjustments before venturing outside. What is the Best Ferret Harness? Most experienced ferret owners and veterinarians will recommend the “H” style harness as the safest and most reliable. When viewed from above, an H harness literally looks like a capital letter H.
The H harness has two big loops. One loop goes around the ferret’s neck like a collar, and the other around their waist, behind their forelegs. An H harness will have an additional strap that connects to the loops and runs along your ferrets spine. Some H harness models have a fourth strap that runs along their belly as well. Make sure that the d-ring or loop where the leash attaches to the harness is located on the “waist” portion of the harness. Some manufacturers don’t place the leash ring at the waist strap, but in the middle of the spine strap. Ferrets have a reputation for pulling on their leashes. If the leash attachment is too close to their throats, they can accidentally strangle themselves! If your ferret is a particularly hard puller, be careful that the harness doesn’t restrict breathing. While the H harness is considered one of the best choices, it may not always work for every individual ferret. There are plenty of variations and other styles that may be a better choice for you and your ferret’s needs. You can find these types of harnesses in different materials, including leather ferret harnesses. Because ferrets are still considered exotic, and somewhat rare pets, it can be hard to find ferret friendly equipment. Many ferret parents find it tempting to try to try using a harness not designed for a ferret. Small dog or cat harnesses may fit, but they are not constructed with a ferret’s anatomy in mind. Dog and cat harnesses and may not be entirely comfortable or safe when worn by a ferret. Other tiny animal harnesses can be found that have been made for hamsters, gerbils, and even lizards. A lot of these harnesses are a simple figure-8 rope or strap, and are not a good choice for ferrets. An iguana is much less likely to slip out of a harness than a ferret, so their harnesses are less secure. A hamster or gerbil is much lighter than an adult ferret, and the harnesses made for them are less durable. With your ferret’s safety and comfort in mind, we have scoured the internet looking for the best ferret harnesses. We’ve found leashes and harnesses that have been designed and made specifically with ferrets in mind. Marshall Pet Products – Ferret Harness and Lead. This harness and lead combination set from Marshall Pet Products comes in a variety of colors. Designed specifically for the anatomy of ferrets, it is one of the most reliable and safe ferret harnesses available. Fully adjustable, this harness comes with easy snap buttons for a quick on and off routine. PerSuper – 2 Pack Pet Harness. As a high quality nylon harness with a nice, soft texture, this product is ideal for ferrets. Being light and durable, it is good for year round use. It’s great for indoor and outdoor play, walking, exploring or jogging. This product is a great example of a classic H style harness with the additional security of a spine and belly strap. The extra belly strap makes this a good choice if your ferret is especially wiggly and can squiggle out of other harness styles. It may be one of your best pink ferret harness options! A vest style harness is another good option for many ferret owners, especially if your ferret isn’t terribly concerned with escaping. They are also great for smaller ferrets, multi-ferret households, and harness training baby ferrets. More comfortable and easier to take on and off, vest style harnesses can be made of foam, fleece, or even nylon mesh. We’ve looked for some of the best vest style harnesses for ferrets. Take a look! Kaytee Comfort Harness & Stretchy Leash. If the vest style harnesses are what works best for you and your ferret, this product from Kaytee is well worth a look. The smallest option for this flexible harness will fit a 5″ to 7″ neck, and a 7″ to 9″ waist. The four foot leash is designed for small pets like ferrets, rats, and rabbits. Affordable and produced by a large and long time reliable brand, this harness style has worked well for many happy pet owners. 13 Fishing – Living World Harness/Lead Set. This sturdy mesh style vest harness has adjustable velcro strapping over the neck and tummy for a snug but comfortable fit. Fully adjustable, it can easily fit ferrets of all sizes for a secure and effortless experience. The mesh style makes it a great choice for all seasons and weather. Breathable and light, it will keep your ferret secure without overheating. Ware Manufacturing – Nylon Walk-N-Vest Pet Harness and Leash. This vest style harness comes in a variety of sizes. Make sure to measure your ferret before any purchases to be sure you are getting the right size. If you are looking for a baby ferret harness, take a look at the smallest size. This can fit an impressive 4 inches to 6 inches around the neck, and 8 inches to 10 inches around the body. The medium size is good for smaller adults, while the large can handle your biggest ferret with ease. Safe and comfortable, this harness and lead are constructed of durable, high quality nylon mesh and strapping. The easy on and off design uses velcro and clips to help make sure the vest stays on and comfortably snug at all times. 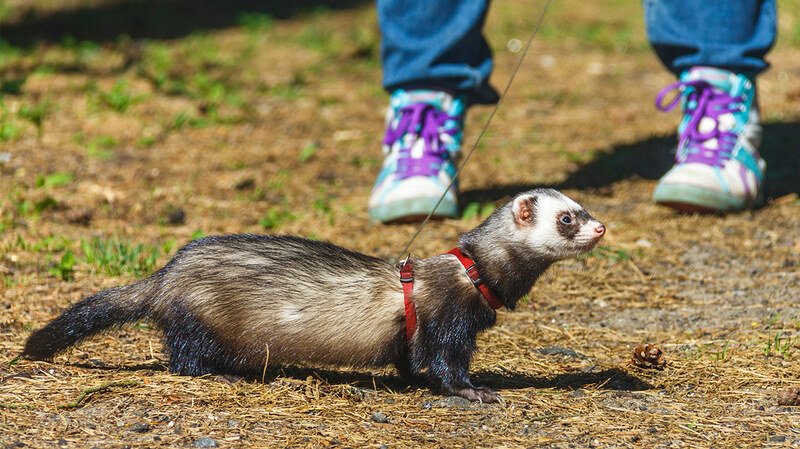 Walking your ferret on a leash and harness can be a fantastic way to release energy, get healthy exercise, and bond with your ferret. Harness training can be a wonderful and fulfilling way to safely take your ferret with you for travel or play. Choosing the best ferret harness comes down to your individual ferret and their needs. If your ferret is particularly prone to wiggling out of a harness, the more secure H-style harness is a wonderful choice. However, if your ferret is particularly small or isn’t interested in slipping away, a more comfortable vest style harness is a good bet. Always test a new harness indoors first where you have the time to adjust the harness to properly fit your ferret. A harness should fit snugly without constricting regular movement and walking. Even with a good quality harness, a ferret should never be left unsupervised when out walking. Do you have a ferret that you like to take out to walk and explore on a harness and lead? What is your favorite style of harness? Share with us in the comments below! Thomson, P. D. (1951). A history of the ferret. Journal of the History of Medicine and Allied Sciences, 6. De Matos, R. E. C. and Morrisey, J. K. (2006). Common procedures in the pet ferret. Veterinary Clinics Exotic Animal Practice, 9. Besch-Williford, C. L. (1987). Biology and medicine of the ferret. Veterinary Clinics of North America: Small Animal Practice, 17. Drs. Foster & Smith Educational Staff, Leash Training Your Ferret. I have the small size of baby ferret. Which type of harness is suitable fr it. I don’t have the knowledge about it. And it getting the comfortable to wear it.